Give yourself the Complete Look on your wedding day. I am a mobile Hair and Make up Artist who has won Multi ABIA Awards and I have the most amazing Job! I get to share with you your most special day. With more than 25 years experience , I am also highly trained in Airbrush Make up. 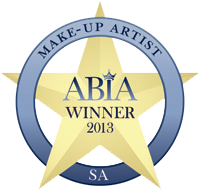 In 2013 , I was thrilled to win The National Australian Bridal Industry Award for Excellence in Make up Artistry.I also won the ABIA Award for Bridal Hair, Bridal Make Up and Beauty Therapy Awards for 2013. My work has also seen me feature on Channel 7's Four Weddings and in numerous Bridal Magazines and photo shoots. I have also assisted celebrity Make up Artist Dale Dorning on photo shoots for S.A. Style Magazine and the T.V commercial for Rundle Place. I am reliable, proffesional and will give you that something special on your wedding Day, Please feel free to contact me at any time. Winner of the ABIA Beauty Therapist Award - Tanning, Waxing and Eyelash Extensions! for 2010, 2011 and 2012. Winner of the 2011 and 2012 Make up Artistry Award. Voted one of the Top 10 Stylists by the Knot - the only stylist in S.A.